There is yet another whole new functionality of Abandoned Cart Pro for WooCommerce plugin that helps you to keep track of number of abandoned cart reminder emails and SMS sent. You can also figure out the number of emails and SMS opened by the customers and the reminder links clicked to complete the transactions. All of these which play a backbone to this plugin comes under a single tab named ‘Reminders Sent‘ which is primarily the most interesting area that assists you to seek the attention of lost customers. Today in this post we will only discuss the 1st part, Emails Sent section. The 2nd part about SMS Sent section is detailed in our next post. As you can see in the above image, this page displays the results in a nutshell. You can have a glance at this page and understand how well the function of sending cart reminder emails have been working for your business. You can select a date range from the dropdown options as shown in the below image and the results will be displayed as per the selection. In the above example, last 7 days is selected from the dropdown options hence the Start Date and End Date is changed to 19th November 2018 and 26th November 2018. You can also simply enter the Start date and End date to select the desired dates and click on the Go button. All the abandoned cart reminder emails between the selected range of dates will be displayed. After the selection of dates is made, the result will be displayed as below. It will show all the abandoned cart reminder emails that were sent to the customers between the selected dates along with the related statistics. 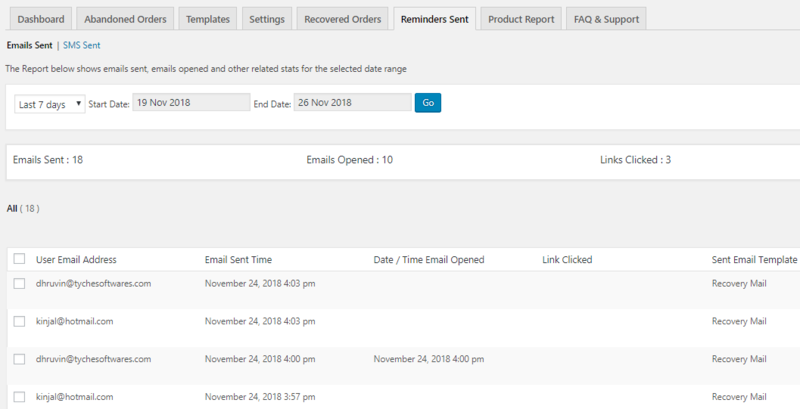 The results area displays the user’s email address, email sent date and time, email opened date and time, link clicked or not and the name of the email template that was sent to the customer. The above example has reminder emails sent to multiple customers for recovering their abandoned carts like kinjal@hotmail.com, dhruvin@tychesoftwares.com, kinjalpaleja@gmail.com etc. The date and time when these emails were sent and opened are also displayed. Under the Link Clicked column, when the link is clicked it will show the name of the page from where the customer got back to the store to complete the transaction and when the customer does not click on the link and leaves the mail without progressing further, the space under the Link Clicked column will remain empty. For instance, that column appears blank for most of the entries except the last one when customer had clicked the link of the Checkout page as shown above. 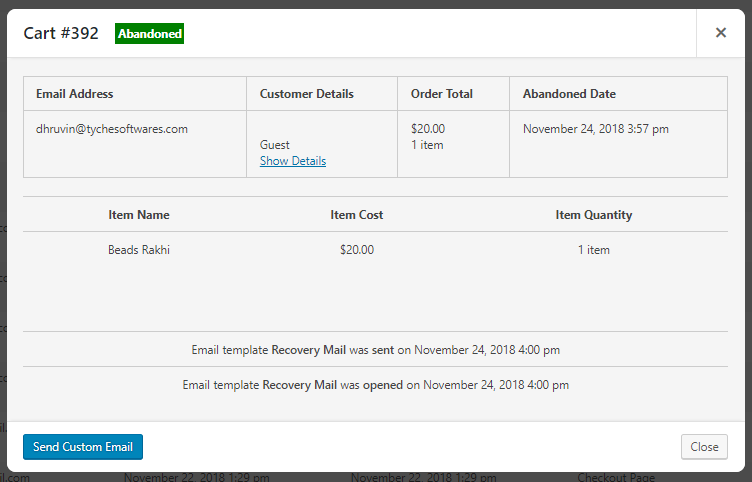 Lastly, the email template which was used for sending the reminder emails to the customer was Recovery Mail, which was sent after 1 minute of cart abandonment. This help you to keep track of templates that are more effective for converting lost customers. If you see, the 2nd last entry shows Recovery Mail template with ‘manual’ written next to it. This is because where the abandoned order for which the manual reminder email was sent will have ‘(manual)’ written next to the name of the template. To know more about it, check our Sending unique email templates post. There is this area on the page where you can check the statistics of all abandoned cart reminder emails sent and can get a complete idea of how many users opened the emails and clicked on the links to get back to the store to complete their transactions. In the above image you can see that the results area shows 18 emails were sent, 10 of these emails were opened at different times and out of these 3 emails were such that the customers clicked the link to go ahead for completing their purchase. This result is usually seen on top of the results display area so that if you just want to check the stats without getting into the details of each email sent, then it would be quite easy and convenient. Also, the Sent Email Template column can be useful to check which template and its contents are persuading the customers to click on the checkout or cart page link to complete their sale. Moreover, the type of link under the Link Clicked column can help you to make a choice whether the cart page link or the checkout page link has been clicked more times and accordingly can make the changes in the email templates. Thus this shows which items are in the cart, its quantity and total amount of this order along with its Order number which is #392 for the given example. Ideally recovered order is a successful order which is placed by the lost customer. 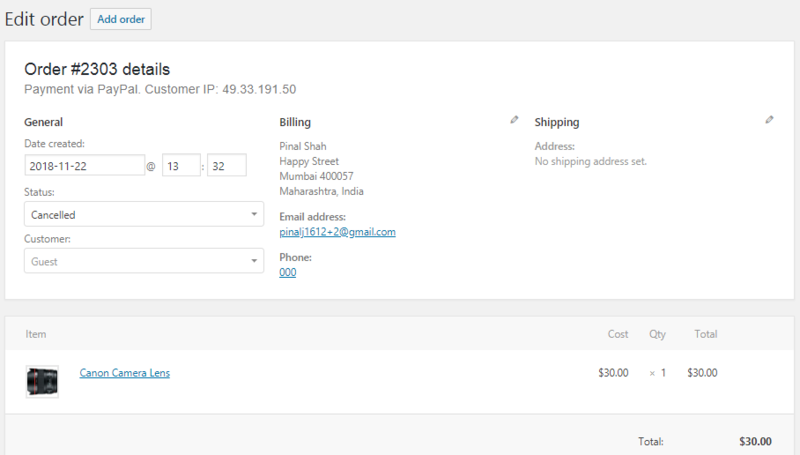 Hence all the details of the order like items, quantity, total amount to be paid, general and billing details as well the mode of payment will be shown all together on this page as shown in the above example. The second part of Reminders Sent tab discusses how SMS reminders are sent to the customers and how its details are displayed on the SMS Sent page to help shop owners interpret the results to evaluate the performance of the online business. This is explained in our next post. This kind of a complete display of all abandoned and recovered carts and its details of reminder emails, all on a single page is extremely commendable. You will definitely not resist from getting your hands on Abandoned Cart Pro for WooCommerce plugin which has such versatility and ease of performance. So Get It & Get Going!! !